The C-130J-SOF aircraft was unveiled at the Paris Air Show held in June 2017. Image courtesy of Lockheed Martin Corporation. The C-130J-SOF aircraft will support high / low-altitude air drop and personnel recovery missions. Image courtesy of US Air Force / Senior Airman Harry Brexel. The aircraft will be armed by AGM-114 Hellfire air-to-surface missiles. Image courtesy of Stahlkocher. C-130J-SOF is a special mission aircraft developed by Lockheed Martin to meet the requirements of the international military special operations forces (SOF). It is the newest member of the Super Hercules family of military transport aircraft. Lockheed Martin introduced the aircraft at the Paris Air Show held in June. The C-130J-SOF aircraft is intended for intelligence, surveillance and reconnaissance (ISR), and psychological operations, high / low-altitude air drop, personnel recovery, humanitarian relief, infiltration, exfiltration and resupply missions. The aircraft can also be configured for armed ISR, close air support (CAS), helicopter / fighter / vertical lift aerial refuelling, and forward area refuelling point (FARP) operations. The C-130J-SOF is based on the airframe of the C-130J Super Hercules military airlifter. It is the tenth production version of the Super Hercules. It will integrate a range of mission equipment and systems to meet the special mission needs. The aircraft will be fitted with lower fuselage protection system integrating a removable specialised protective material to avoid damage to the exterior of the fuselage and other critical systems. The C-130J-SOF will measure 29.61m-long and 1.84m-high, and have a wingspan of 40.41m. The maximum take-off weight (MTOW) and payload capacity of the aircraft will be 79,379kg and 18,023kg respectively. The two-pilot cockpit will feature fully integrated digital avionics and colour multi-functional liquid crystal displays (LCDs), low-power multi-mode colour radar and a digital moving map. The cockpit will also be equipped with a ground collision avoidance system (GCAS), a traffic collision and avoidance system (TCAS), a night vision goggle-compatible head-up display, terrain awareness and warning system (TAWS) and a flight management system (FMS). The navigation and communication systems will include inertial navigation system (INS), dual global positioning system (GPS) and a low-noise interphone system. The aircraft will be equipped with an enhanced cargo handling system (ECHS) to enable the precision air drop and rapid cargo bay reconfiguration times. It can integrate an Orbital ATK roll-on / roll-off (RO-RO) pallet, and weapons mount to enable the installation of a 30mm gun system. The other mission equipment and systems aboard the aircraft will include work stations for a combat system operator (CSO) and scanner and external fuel tanks for longer range and endurance. The CSO station allows the monitoring and operational control of the electro-optical (EO) / infrared (IR) and radar systems, defensive aids and refuelling systems. The chin-mounted gimbal below the nose of the aircraft will house an EO/IR imaging system, which will deliver real-time imagery during day and night for situational awareness and targeting capability. The imagery and data gathered by the turret sensors will be presented on the displays mounted in the CSO station and the pilot front panel. The C-130J-SOF can be fitted with a refuelling probe and drogue system to refuel tactical aircraft, helicopters and tilt-rotors. The single-point refuelling receptacles will enable rapid ground refuelling operations. The aerial refuelling probe installation system (ARPIS) modifications will further enable the aircraft to receive the fuel from hose and drogue tanker aircraft. 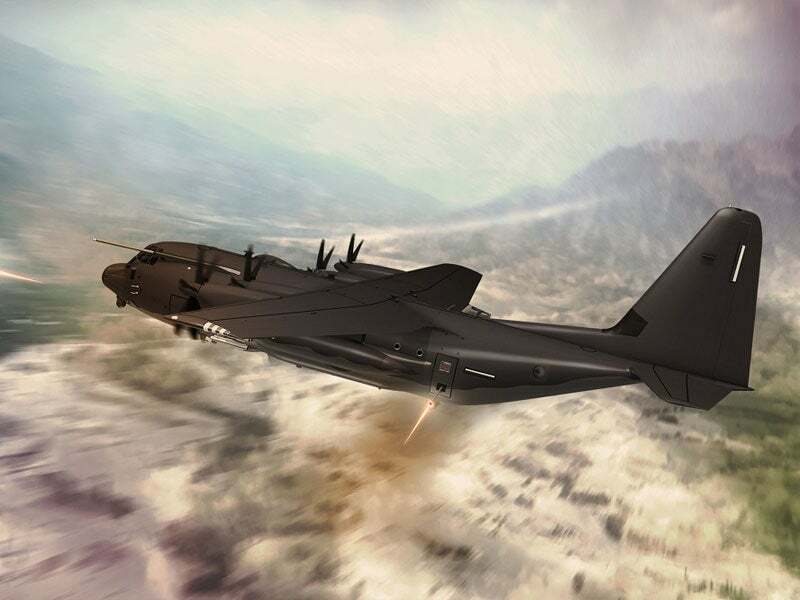 The aircraft will be armed by a 30mm GAU-23 Bushmaster automatic cannon, and AGM-114 Hellfire air-to-surface missiles (ASMs) for a multi-mission, multi-target precision-strike capability. The Hellfire missiles will be attached to the underwing weapons pylon. "The aircraft can also be configured for armed ISR, close air support (CAS), helicopter / fighter / vertical lift aerial refuelling, and forward area refuelling point (FARP) operations." The cockpit, under-deck area of the cockpit, augmented crew station area on the flight deck, and the loadmaster station will be equipped with armour protection system to withstand 7.62mm rounds and small arms fire. The directional infrared countermeasure (DIRCM) defensive system suite aboard the aircraft will employ a radar warning receiver, an airborne countermeasures dispenser system and a Terma defensive aids controller (DAC) and a Cassidian AAR-60 missile warning system to protect the aircraft from incoming infrared guided missiles. The aircraft will be powered by four Rolls-Royce AE 2100D3 turboprop engines, which develop 4,691shp each. Each engine will be coupled to a GE-Dowty Aerospace R391 six-bladed all-composite propeller. The power-plant will ensure a maximum cruise speed of 660km/h. The aircraft can attain a range of 3,815km with a payload of 13,607kg.